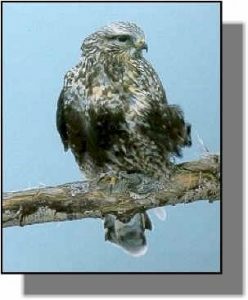 Comments: Rough-legged hawks have feathered legs, giving them the “rough leg” look they were named for. Plumage color is variable with darker birds found in eastern North America. In lighter colored birds, white at the base of the tail is visible. In flight the underwing pattern shows a black wrist patch and flight feathers with a white base and dark tip. Distribution: This species is found in North America, Greenland, Europe and Asia. The North America subspecies breeds north of the treeline in Canada and Alaska. They share their nesting cliff habitat with peregrine falcons and gyrfalcons. Rough-legged hawks are one of the more abundant raptors in North America and are regularly seen in Kansas during winter. They prefer open habitats of the western parts of the state. Food: While on the breeding grounds lemmings are their food of choice. In Kansas, voles and cotton rats provide suitable substitutes. Hunting is usually done from a fence post or utility pole or while hovering over a likely area.